No introduction to economics lesson plan is complete without answering the question "What is economics?". This lesson plan helps teachers to answer that question along with introducing some of the terminology used in economics so that students can fully understand what they are reading and listening to. Once students understand the concept of terms used in economics they will be able to apply them to their economics lesson plans. Begin by asking students what economics is. Allow students to discuss their own theories on what economics is and why they need to learn about it. Then, define economics to the students as the study of how society chooses to allocate its scarce resources to the production of goods and services to satisfy unlimited wants. It’s likely that students will look confused. Ask them to consider the gas problem. Explain that gas is made from oil, which is a natural resource. Those who decide where we will buy the oil and set the prices for gasoline are using economics to come up with the plan that sets the terms and prices for the use of the oil. Explain that this is just an example of economics in practice and ask students who else might use economics in their jobs. Would ice cream sell well in Alaska? Would Mountain Dew sell as well if the price went up by $1 per 12 oz. can? If the price of lumber doubled would the same amount of houses be built? Allow students to answer and discuss these questions. Then explain to students that the economic way of thinking is only effective if all variables are considered. Theories can be made and some facts may be assumed for the purposes of answering the questions, but the answer will change when the variables change. The economic way of thinking tries to avoid making mistakes by considering all variables. Ask students to consider the following situations. Would ice cream sell well in Alaska if there was a serious drop in the amount of dairy products available? Would Mountain Dew sell as well if the price went up by $1 per 12 oz. can if all other sodas went up by $2 per 12 oz. can? If the price of lumber doubled would the same amount of houses be built if there were 5 natural disasters? Did the answers the students originally gave change at all? Allow students to discuss why their answers changed. Explain to them that this type of reasoning is the type of reasoning used by economists. 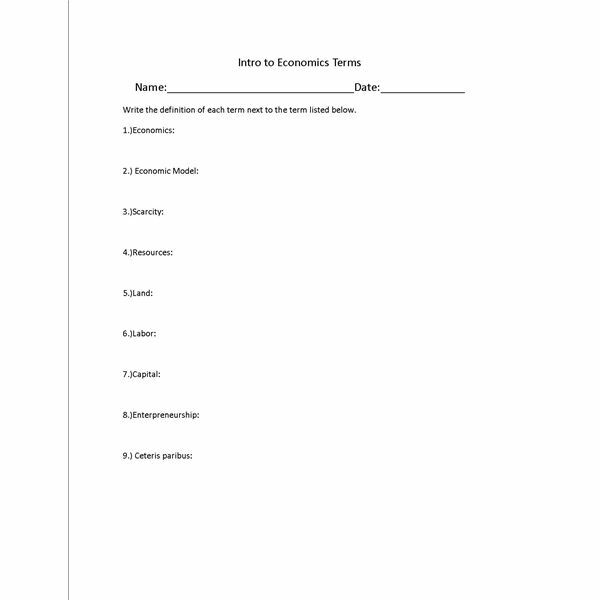 Next, print the vocabulary worksheet included with this Introduction to Economics Lesson Plan. Ask students to take home and complete the vocabulary worksheet.